An interesting set-up, Górnik Zabrze crowd the 6-yard area with 4 players and Cracovia Kraków respond by marking them with 6 players + the goalkeeper in the same area. Angulo (#17) and Dani Suarez (#15) both make runs towards the front post, dragging their markers with them. This creates a bit of space in the 6-yard box, whilst Michal Koj (#14) and an unidentified player attack the back post. The corner somehow eludes everyone and makes it towards the back-post for a simple header in from Koj. A very similar set-up to the previous corner with Angulo (#17) taking up the same space and making the same run to the front of the 6-yard box with Lukasz Wolsztyski (#25) moving into the space he vacated. The rest of the players then attack the far post, however, it’s not needed as Angulo manages to meet the ball at the front of the 6-yard area and heads home. Again Górnik Zabrze crowd the 6-yard area but change the approach in the execution of the corner. The corner is taken short, with the corner taker overlapping Damian Kadzior (#9), receiving the ball back before whipping the ball to the back post where 3 players are on hand to attack the ball, resulting in an easy unchallenged goal. Another different approach and looking more like a generic corner. I feel that Górnik Zabrze have taken advantage of Nieciecza’s defensive setup. 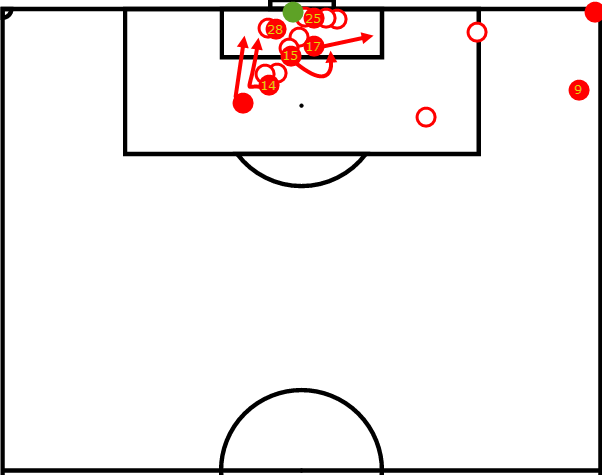 With the 6-yard box practically empty there’s plenty of space for the Górnik Zabrze runners to attack. The initial header is saved by the person on the post but the onrushing of Górnik Zabrze attackers manage to scramble the ball over the line. Despite the different initial layout, the underlying principles Górnik Zabrze use are the same, players looked to be ready to attack the front post (although had to adjust for the delivery), whilst also attacking the back post – a common theme of the corners looked at so far. A very interesting corner that shares some similarities with some of the corners already looked at. The most interesting similarity is the movement and use of space. Each player moves into the area previously vacated by the person in front of them. So Angulo (#17) starts the chain off by running towards the front of the 6-yard box, Dani Suarez (#15) then attacks the space left by Angulo and his marker whilst Wieteska (#4) then attacks the space left by Suarez. The unidentified player next to Suarez loops round to attack the back post. Again there’s a clever use of movement and space. Angulo (#17) and Wolsztyski (#25) move both towards the near side of the 6-yard box, with Suarez (#15) and Wieteska (#4) moving to occupy the now-vacant space – heading home in the process. The players in the 6-yard box flood forward, creating plenty of space at the back post. One of the players towards the front post gets a flick-on allowing Koj (#14) to head home at the back post. Another slightly different approach, the corner is taken short and played into a dangerous position. The players in the 6-yard box leave the area dragging their markers with them whilst Koj (#14) and Wieteska (#4) attack the back post from deep, scrambling the ball home in the process. It’s clear that Górnik Zabrze’s success from corners is no fluke, every player has a clear purpose and knows their run and timing to perfection, and it’s obvious these routines are well rehearsed and the number of goals it has resulted in shows the advantages that clubs can gain by spending time on set-pieces. Their corners rely on 2 key components – movement and the attacking of space. The moves normally start with Angulo (#17) and Wolsztyński (#25). Being strikers, they draw the most attention from the defence, yet they don’t really play a role (other than sometimes managing to get flick-ons) in the goal itself, instead helping by their clever movement. Both players rush forwards towards where the corner is being taken from. This creates space for other players to run into and attack. The next 2 players that are vital for the move are Koj (#14) and Wieteska (#4) – these are the players that attack space, they either make long runs to the back post or attack the space left by Angulo or Wolsztyński. To counter these tactics, personally, I’d say the best option would be to try to restrict the space that Górnik Zabrze attack. Above we can see they focus on 2 zones – the back post and the near side of the 6-yard box. Therefore we pack this area with players. As Górnik Zabrze pose such a threat, I’d recommend every player in the box to defend and would implement the following defensive scheme. I have marked the players with either a “Z” or an “M”. 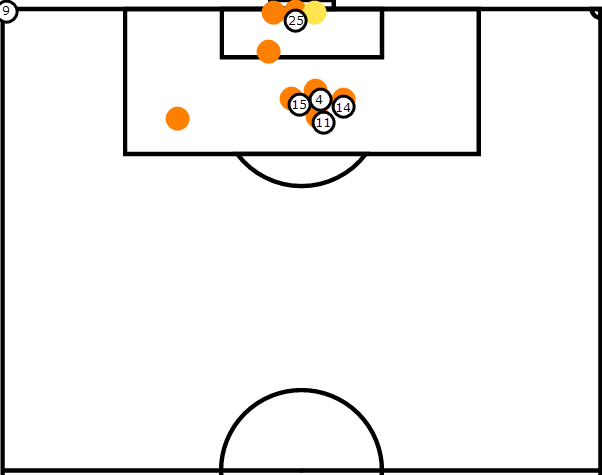 A player marked “Z” means the player is zonal marking, so we put 2 players in the spot where both Angulo and Wolsztyński usually make runs to. This should give them less space to run into, causing the rest of the move to be less effective. We also have 2 players zonally marking the back post for the same reason, restricting Koj and Wieteska’s runs towards the back post. Finally, another 2 zonal markers take the most important area, the very centre of the 6-yard box. The players marked “M” are man-marking, one of which is put on either Angulo or Wolsztyński (both don’t need man-marking as they’ll most likely be running into our 2 zonal markers so will be outnumbered), the other 3 man markers will be set on the 3 aerially best players (definitely one each on Koj and Wieteska). 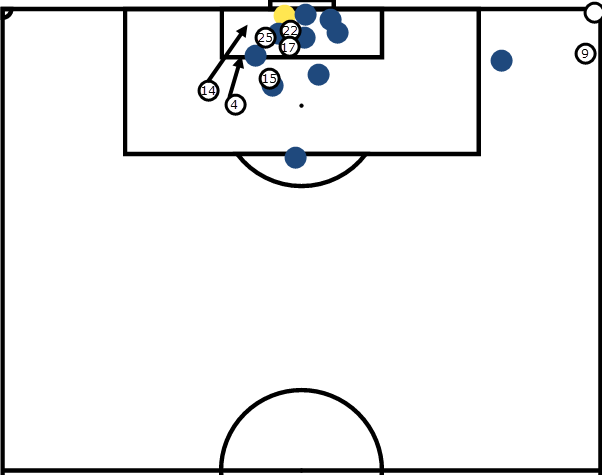 This should hopefully provide cover in all the main areas that Górnik Zabrze focuses on, and restrict the number of chances given away from set-pieces. That being said, Górnik Zabrze have hugely impressed me, it’s rare to see a team so synchronised, with everything running like clockwork and posing such a threat. It’ll be interesting to see if they can carry it on throughout the season, and how many points a continued set-piece threat will manage to get them.